The plants you see here, both above and below the water line, are all real. Aquarist Steven Baker has set up a tank that extends way above the watermark. We meet the man who brought a piece of Borneo to Britain. Steven Baker is an aquarist with ambition. A long term fishkeeper, with ample time spent in the industry, he’s picked up a lot of ideas along the way. For some time now, Steven’s tank photos have caught my eye. To my mind, he’s a conventionally unconventional fishkeeper. I see classic biotopes — his African Rift lake aquaria, which we’ll be featuring in a future issue — perfectly executed, while his unique take on a community tank is a modern angle on an old theme. My original plan was to cover all of Steven’s five current set-ups in one heavily abridged feature, but the first tank I saw threw all of that out of the window. Hitting you like a triffid as soon as you enter his living room, Steven’s above water/below water set up becomes the main attraction. Leering from the wall — he calls it the ‘wall of life’ — is a bounty of colour. Vain orchids compete for attention amongst creeping vines, and it is only with persuasion that I’m convinced that what I see isn’t synthetic. A squeeze of a leaf confirms its authenticity. Below it all, nearly lost against the colours, sits a glass-trapped pool of orange water, testament to the acids and decomposition true of Steve’s intended habitat. Half filled, this tank is his vision of Borneo — slow and dark, and alive with fish that require patience. Expanding foam was used to create the background of the plant wall. “Imagine setting off to a faraway tropical country; a couple of days travelling on airliners, beat-up buses, small charter planes and 4x4s. You set down for the night under a roof thatched with palm leaves supported by bamboo frames. It’s warm enough that walls aren’t really necessary. “By afternoon the following day you’re walking through dense, tropical rainforest surrounded by lush growth and an abundance of life. Hours in, you stumble upon a small, shaded forest stream. The water is stained brown by discarded leaves from the canopy above. Terrestrial plants grow sparsely in the low light but enjoy the high humidity along the banks. More adaptable plants spill into the water where they grow fully submerged. Taking a few steps for a closer inspection of the plants, you notice the hasty movement of fish darting away from the vegetation to be lost among the leaf litter. “That’s what I did... I imagined my trip to Borneo. “Aside the barriers of time and money I’m unsure I’ll ever actually go. The idea of creating all the pollution travelling across the world, so people like me can stomp through the undergrowth and go home with memory sticks full of imagery turns a sweet dream sour. “So… forget about it? No. I can still experience it indirectly. “If you’ve visited the Eden project in Cornwall or if you’ve ever driven a Caterham7 kit car rather than the original Lotus7 you will understand that replicas can be authentic — and so can an aquarium. “A biotope is fishkeeping’s Caterham — a product of lengthy research that aims to be an authentic replica of nature. For the tank here, it was around three months between the original idea and laying down anything physical. “First, I needed to cross reference the fish I wanted, build a shortlist of fish species and study pictures and videos of my desired habitat. Once a design was conceived I could consider the materials and methods, factoring in how to conceal my cables, pipes, heaters and filters. “I wanted to move an existing shoal of Redline rasbora, Trigopoma pauciperforatum, from their 70 l dwelling to a more spacious home. They’re not a fish that normally floats my boat; I’m attracted to character and oddities, fish like puffers, leaf fish, killies and small cichlids. “They shared their tank with some Indonesian floating frogs (or Puddle frogs) Occidozyga lima, which I also wanted to move on to a larger setting. Luckily, their areas of distribution overlap among the slow-moving forest streams of Borneo. “So that was my start point. Garden and aquarium all in one place. “Because the tank I intended to use would be open-topped, I opted for a low water level — there would be less chance of me finding frogs crisped on the carpet one morning. It also allowed me to plan for a world of mosses, ferns and some classic aquarium plants growing just above the water. “Borneo stream biotopes have low equipment demands. Recreating a shady habitat means a standard internal, T8 light or an inexpensive LED unit and a conventional heaterstat will suffice. My light unit is a low-power Arcadia stretch LED which is ample for basic plant growth. 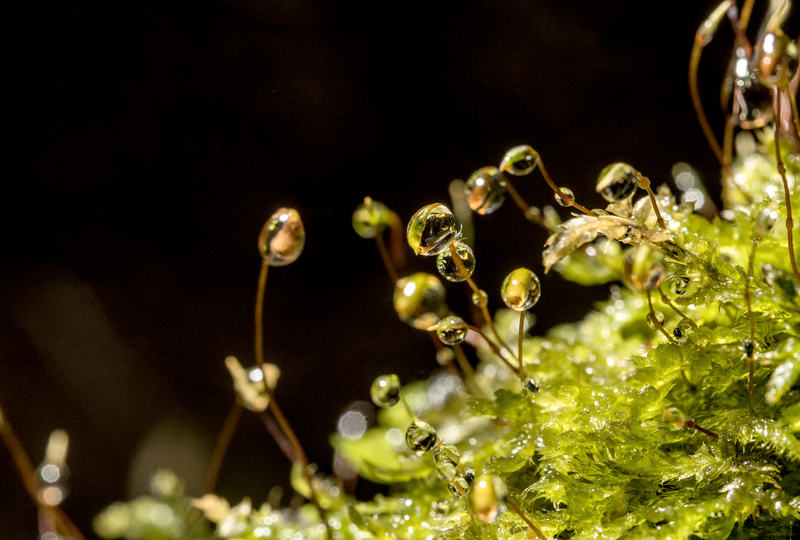 Mosses in the tank collect moisture. “Vegetation is quite sparse, and made up of slow growing, low energy species so additional CO2 isn’t essential and liquid fertilisers can be basic and dosed lightly. Substrate fertilisers are worth using, holding adequate nutrients to last a long time. Colour above contrasts with the tank below. “Decor in my tank is a dedicated affair. Early on, a doubting voice popped into my head: “If this doesn’t work it’s going to be hell getting it back to clean glass!” A deep breath later, and I’m opening a second can of expanding foam. “I’m an aquarist at heart, but I work on a site that also deals with amphibians and reptiles. Though I expected to be enchanted by frogs and lizards, in the event I was overwhelmed by ‘crossover products’ like decorative sealants and mist makers. Each marked a new possibility for my fish tanks! “I used expanding foam on the plant wall above the tank and was happy about using it in the tank. When I discovered a sealing resin and a range of colouring powders marketed for amphibians, I knew the destiny of my new set-up. “Straight from the tin, the resin was a pale, stone grey — ideal for sealing the lower level where the substrate blends into the background. To blend further I used a heavy coating of resin and covered it with sand and fine gravel, which stuck as it dried. Once happy with the substrate level I added a brown colouring powder to the resin and completed the rest, this time adding coconut fibres instead of sand for texture and realism. “When the resin dried, I tidied any excess from the glass and the wood and put down the substrate. I used Seachem Flourish gravel as a substrate fertiliser covered initially with coarse German quartz gravel, then fine 1mm quartz gravel in patches, topped off with JBL Sansibar river sand, a natural-looking substrate that tends not to compact as easily as other sands. Leaf litter added the finishing touch. “A Borneo biotope has a limited plant selection available. To start simply, Cryptocoryne bullosa is easy to get hold of, but how natural the obtainable strain is may be questionable. Still, it’s a lovely plant to grow above or below the water line. “The once scarce Bucephalandra motleyana mostly grows above the water, clinging to stream-side boulders and creeping up muddy banks. Bucephalandra species are widely available now but there are so many variants that if you want to stay true to the regional biotope it may take some searching. “Then there are species you just will not come across in your local fish shop. Luckily I have a contact, Luke Landsburgh from Bucephalandra UK, who was able to supply me with a natural form of Cryptocoryne bullosa, with a much more prominent ‘hammered’ effect to the leaf compared to my shop bought plants. He also supplied Barclaya motleyi, a dark lily-like plant which is yet to show strong growth, Java fern ‘Narrow’, Aridarium to grow on the ‘bank’ and some Bucephalandra, all of which come from Borneo. The ‘Pentazona’ barbs have encouraged the rasboras to be more outgoing. “Though Redline rasbora and Puddle frogs were the original inspiration for this tank, I also already had three Khuli loach, so these joined the mix. 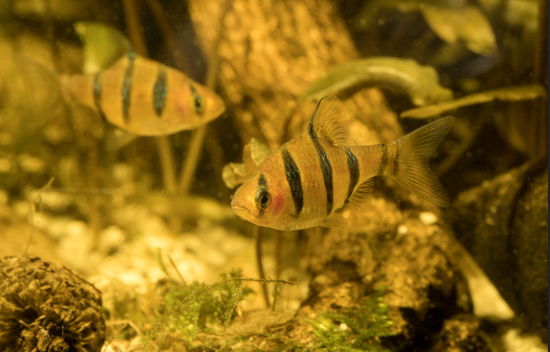 “I added a common Bornean species — the ill-named Pentazona barb — to act as a dither fish and inspire confidence in the rasbora. Pretty much all commercially available ‘Pentazona’ are in fact the more prevalent Desmopuntius hexazona, as mine are. Geographically, they perfectly suit the location of this biotope and they have also encouraged the Redlines to be more outgoing. “Then there is the fish that really hits the target; the Forest halfbeak. Hemirhamphodon pogonognathus is a full-on predator by design. From its pike-like fin placement to its super-sensory beak detecting the smallest of surface movements, it is fully equipped to feed on flies, gnats, beetles and anything else that falls on to the surface. At 10cm they can threaten small fish even though their attention is focused on the surface, but if they can’t swallow them there’s no danger. They’re unaggressive toward other fish and only slightly so between conspecifics. “There’s also a pair of Betta albimarginata, which appeal to my love of cryptic fish. I can search for them for some time without a sniff, then all of a sudden they’re right in the middle of the tank, bold as brass before they are gone again. I had to slightly bend the rigidity of my location for these as they live quite a few miles to the west of where I had set the biotope. Occupation: Aquatic retail assistant and also building Cambridge Aquatics as a maintenance service for tanks and ponds. Time in the hobby: 27 years. Most ever spent on a fish: £175 on a Koi. Dream tank: A converted indoor swimming pool with sunken logs, lilies and waterside planting. Fish would include a Mbu puffer, a group of Mastacembelus eels (whichever best suit the range of the puffer) and some mid-sized African catfish. Phalaenopsis lend themselves well to the lush wall. Tank: 120 x 45 x 38cm/48 x 18 x 15in. Filter: Aquamanta EFX400 external canister. Heating: 200W in-line Hydor external heater. Lighting: Arcadia Stretch LED on the tank. Fluval Plant LED on the wall. 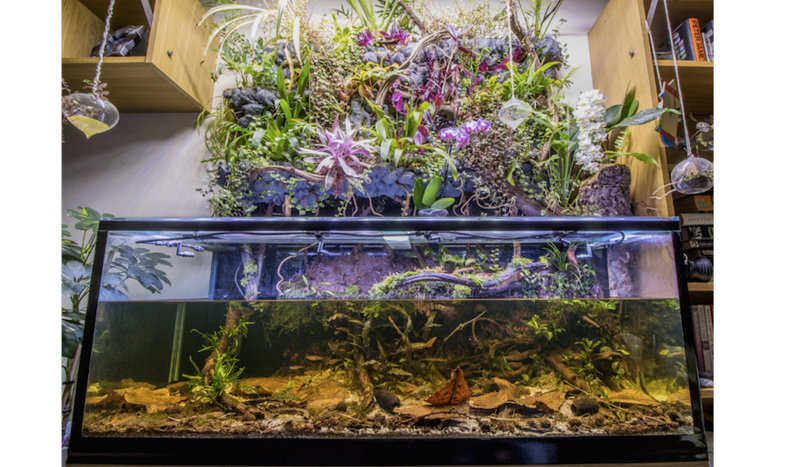 Two continents in one room: Steven’s Borneo biotope sits alongside an African set-up. Three months of research and planning. About 12–15 hours to construct over three days. It’s now just over seven months old. What was the approximate cost? The display of the plant wall and the tank display with all the materials, wood, roots, substrate and so on came to £200, give or take a little. The tank and equipment was purchased bit-by-bit and all some time ago. A ballpark figure overall would be £550 if I think quickly. I don’t want to think for any longer as it probably cost more. I’d have to guess at the cost of fish and plants — maybe £85 for livestock and a similar amount on the plants. Which aspect took the longest? Building up a reasonable selection of plants. How is the plant rack constructed? How is it supplied with water? It’s built on a background made from an old shop shelving unit (a peg panel, from which you’d normally have hooks jutting out). Guttering was attached, with drainage pipes and airline to feed water through an airline splitter. A small pump in the tank waters it all for just one minute once a day thanks to a digital plug timer. What filter media do you use? Three stages of foam and a mixture of different biomedia collected over the years. There’s definitely some Eheim ehfisubstrat and Fluval Biomax in there. How do you keep the water stained and acidic? I add Catappa and Oak leaves regularly but mostly I boil up Alder cones to make my own blackwater extract. Temperature is 25.5°C, pH 6.2, KH 5, GH 10. I test a lot in the early stages to get to know the tank. For the first three months, I tested weekly but I have found this set-up to be quite stable. I now check hardness and acidity one a month. Do you favour a fish-in or a fishless cycle? I’ve had fish tanks solidly for many years so I have the beauty of mature filter media on hand. For anyone without this available I definitely recommend fishless cycling. It’s a good way to get used to tank maturation and using test kits without harming fish through innocent enthusiasm. What’s your advice to anyone who’d like a similar set-up? If you are at all crafty or artistic it’s not hard. If you struggle with model making or flat packed furniture, then maybe you should call in a mate!